Mama knows you're just being modest when you push your 3DS away and say you're full. She whipped up another helping of culinary cuteness with Cooking Mama 5: Bon Apétit, and North American players can go up for fifths this 16th September. Majesco Entertainment dropped the release date today. Their updated press release doesn't reveal any information that wasn't already known from the original announcement, but it bears repeating that Mama will be holding a Cooking Dojo among 30 other new activities available within the game. Does Cooking Mama 5 have you salivating for September? Wait, Cooking Mama's still a thing? I thought that series died when the Wii and DS generations ended. Love that tagline. Makes me want to bust out Cooking Mama 3: Fry Hard with a Vengeance. This series is still going on? My wife has them all and is eagerly awaiting this one too. No idea what she sees in it, but she enjoys playing them all so I leave it at that. Sorry, that is Curtain Call Day. Another game coming out on my birthday? They sure wish sucking the money put of my wallet. Not that this does a good job at it, though. Sooooo excited to get this finally. I started buying this series in 2006 and have every version they made so far. Sad to see people make fun of this because these games are great! @TheWPCTraveler Haha abs don't forget Hyrule Warriors gracing us just a two days after. Well least it has a shot at selling since it's before Hyrule Warriors. Heh, heh, I'm just as surprised as ya'll are. The series is still going strong sales-wise. 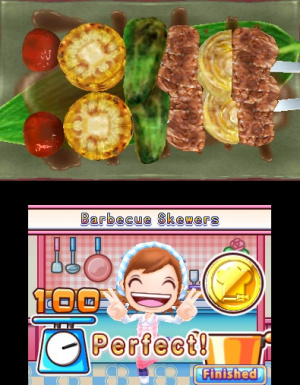 Cooking mama fever isn't looking to be dying yet.